As mobile continues to explode, there’s a lot of buzz around responsive web design. But what happens when forms are in the picture? A “responsive” site attempts to optimize its presentation across a range of displays. That’s fine when your users are mostly consuming content. When they need to interact with your site, client-side responsive design is not enough. I’ll focus on just a couple of important items in this article. If you’re interested, Chui Chui Tan’s excellent article Mobile Form Design Strategies offers a number of guidelines for efficient mobile forms. Break the form up into small steps. 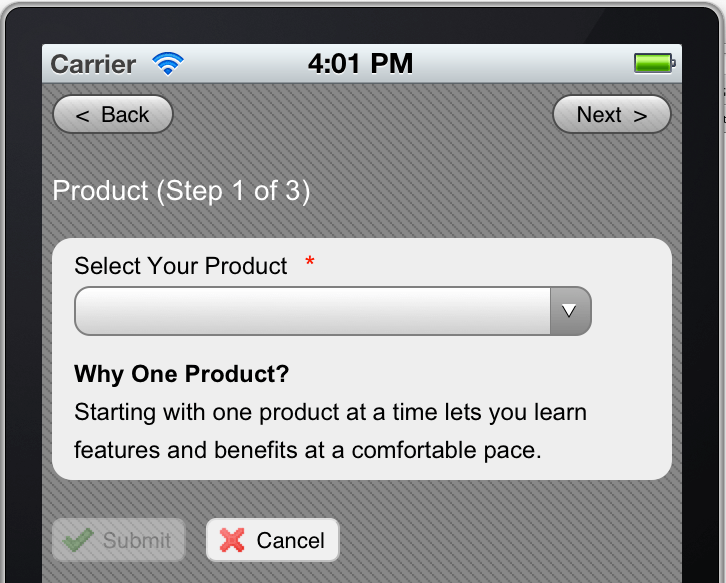 The above form has three logical steps: choose a product, create your profile, and provide an address. Make use of the device’s features to make life easier for the user e.g. specialized keyboards. 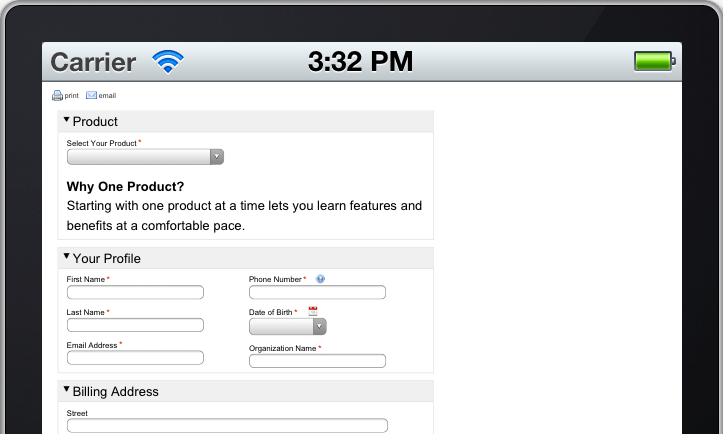 With frevvo Live Forms, customers will be able to easily create forms that look and work great on a mobile device. 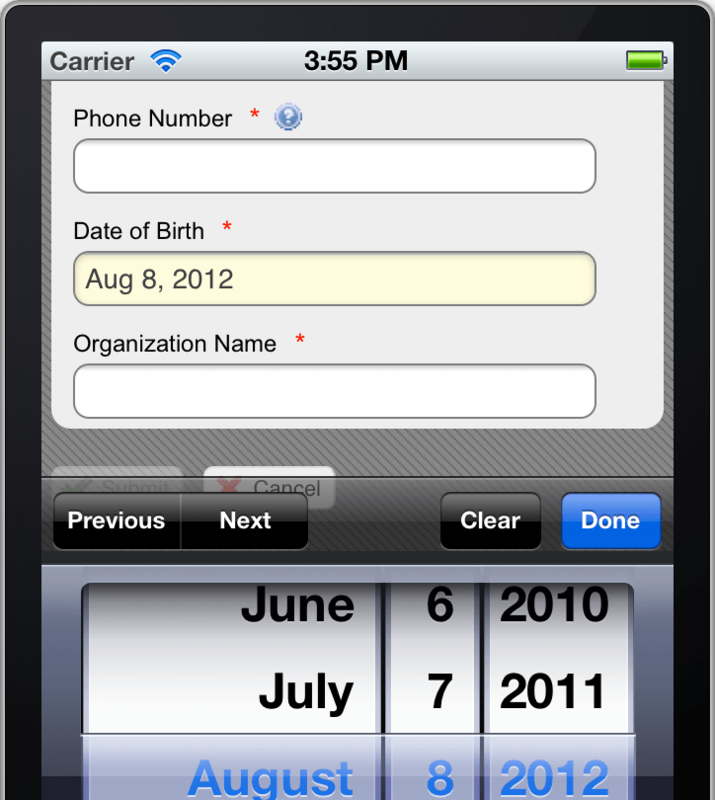 The software will automatically break up the form into steps and add Back and Next buttons. The user can also swipe back and forth to navigate through the steps. Of course, as the form designer, you can always tell frevvo where the logical breaks are. If available, the device will automatically show the most appropriate keyboard for your control e.g. date and time pickers, email addresses, numeric fields, phone numbers etc. Users don’t like having to switch keyboards on the phone to find the @ symbol when entering an email address or switch to the numeric keyboard to enter a phone number. It’s a small convenience that I’m sure your mobile users will appreciate. Of course, there’s a lot more that frevvo can do for you on mobile devices and I’ll be sure to post updates in the coming weeks.